Sangria is traditionally made with red wine, but for a change I decided to make a white wine sangria using a local chenin blanc. This time last year my eyes were taking serious strain. I had gone for the most expensive multi focal lenses and for the first 3 months they worked really well. But, within 6 months I was not seeing as comfortably as when I had first got them. My left eye seems to be deteriorating much faster than my right. This made my left eye feel tired after working all day. It got more and more difficult to read novels and use the iPad. And eventually the strain of trying to see properly got too much for me. I decided to go and see a new optometrist in the hope something could be done to help me see better. She decided that making the left lens stronger than it needed to be would be the way forward. I am not yet sure if this solution will work in the long-term. But, 3 months in I am still managing to read with more ease than I was last year. And this is of course reason to celebrate. We have had some lovely hot days and I felt that a white wine sangria would be the perfect drink. I started off with the wine content being too strong. After a few sips I decided to add more citrus juice to the mix. It made for the perfect lunch time drink. It is also very refreshing which was a bonus given the heat wave. You can make this more festive by using champagne rather than wine. If you do so, be sure to stick with a Brut so as to not make it too sweet. Which option would you go for? The wine or the bubbles? this sounds like the perfect celebration drink (: i’m not a huge wine drinker, but with all that citrus and fruit, i’d happily sip this! Fabulous recipe, Tandy. I am going to make this for Christmas Day, which I am hosting. Sorry to hear about your eye problems. Have you seen an ophthalmologist, maybe the deterioration is due to something to do with the eye itself and not just the lens. Michael has lots of eye problems due to all the cortisone and we have an optometrist and an ophthalmolgist who work together. 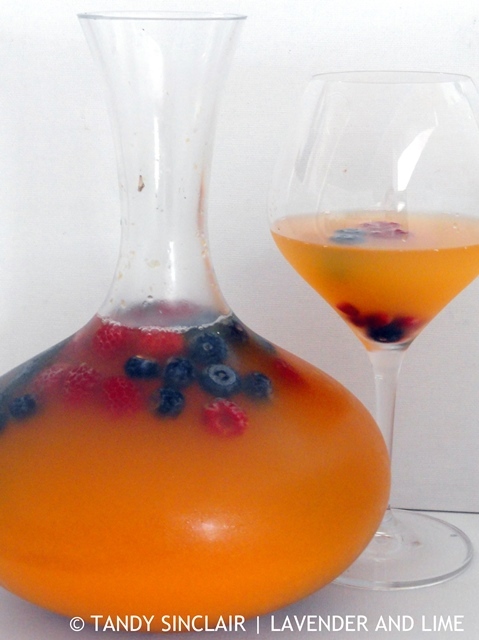 This sangria looks wonderful, I would try the white wine over the bubbly. I need to try the bubbles before deciding. That is such a coincidence. Enjoy! Good to hear that your left eye is better as I know how much you love to read. That’s a tough question as I always seem to love bubbles! I love sangria! This seems a great recipe! Thanks! 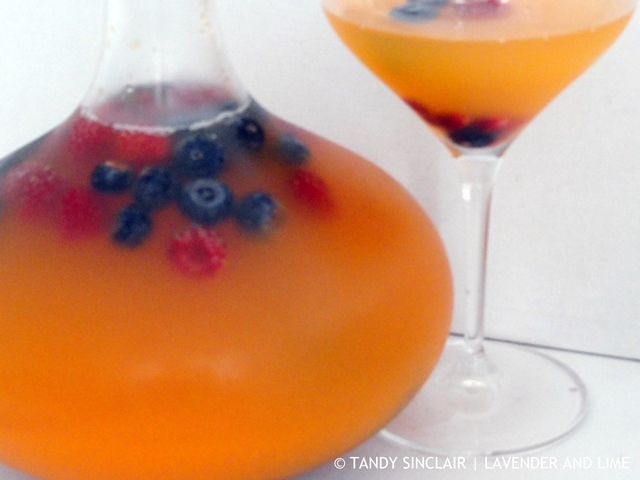 Sounds like a great sangria Tandy.